How to keep the FacilitiesMap and Mapguide session from timing out while in use. There are currently three options listed under the application menu selection in the administrator; Manage Maps, Manage Reports & Searches, and Manage Custom Searches. 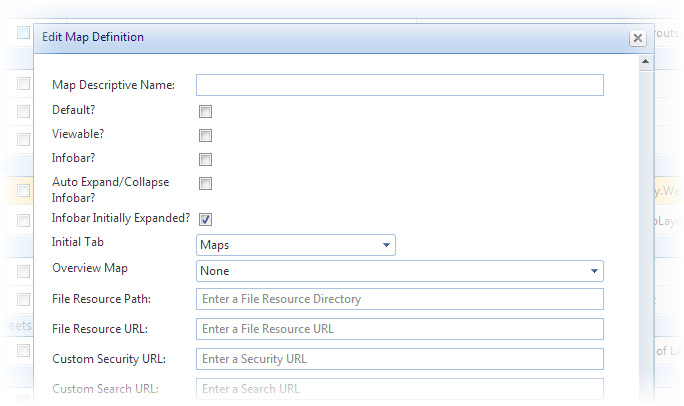 The manage maps options allows the administrator to define which maps are available to the site and manage their permissions. Here you can manage existing maps and assign role permissions. The list of maps is automatically populated by the site Map Server settings. Roles may be assigned to or removed from any map by using the Manage Roles dialog. The default role assigned to any new map is 'Everyone' with Read access only. The third column is a check box that sets whether or not a map is view-able in the front-end. The fourth column sets the default map for the site. The fifth column sets whether or not the Infobar is view-able when viewing the map in the front-end. The sixth column allows you to delete maps that are no longer found on the map server. The delete icon will only show up if the map no longer exists on the map server. Map Descriptive Name: The name that appears in the drop down in the FacilitiesMap front end. Default? : Whether this is the default map seen when the user first logs in through the front end. Only one can be selected per site. Viewable? : Whether this map is viewable in the front end site. Infobar? : Whether the Infobar is visible in the front end site. Auto Expand/Collapse Infobar? : If enabled, the Infobar (if enabled) will automatically collapse when the map selection is cleared using the Clear Selection custom command (setup required) and will automatically expand when a map selection is made. Infobar Initially Expanded? : Whether the Infobar (if enabled) is initially expanded in the front end site. Initial Tab: The tab that shows after you log into the FacilitiesMap front end. Overview Map: Controls whether the overview map pane is visible and which map is displayed in the overview map pane. File Resource Path: If information is entered here, the File Resources section appears at the bottom of the Infobar. This folder will be browsable by the users. Permissions will need to be set correctly for a user to download/view the files. File Resource URL: Relative URL to the FacilitiesMap root, the mapped URL path of the physical File Resource Path above. 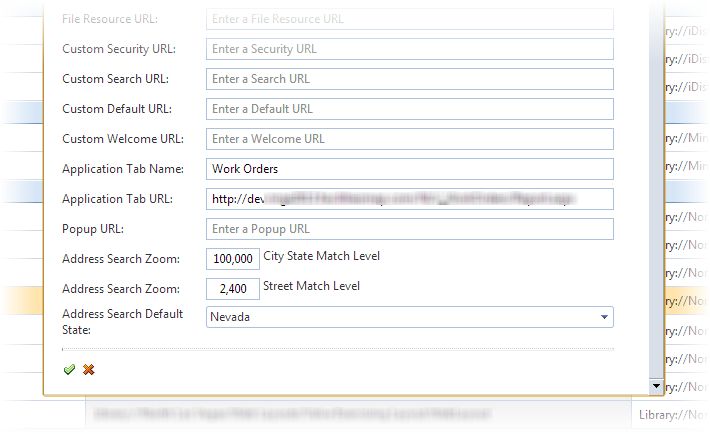 Custom Search URL: This is the URL of a page that could replace the entire built in search functionality of FacilitiesMap in favor of a custom developed search page. This would be a tricky coding endeavor as certain FacilitiesMap parameters are required for the search to select and zoom properly. Custom Welcome URL: This is the URL that specifies the initial page that displays in the Infobar. 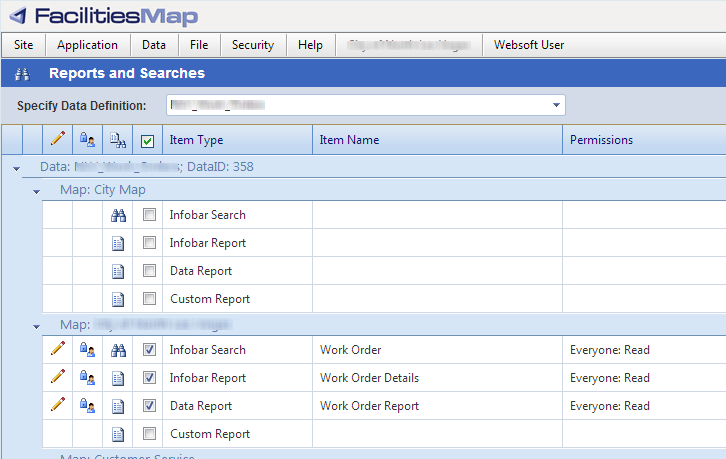 Application Tab Name: The application tab shows up next to the data and map tabs in the FacilitiesMap front end. This field sets the displayed name. Popup URL: This is the URL of a page that will popup upon login by any user. It was intended to be a simple notification tool. It is map specific. It will only popup once per login session. Note: the following options are only available if Zoom to Address is turned on in the Site settings page. This function can only be enabled by Websoft Developers. City State Match Level: Zoom level if address search only finds a city/state level match. Street Match Level: Zoom level if address search finds an street level match. Address Search Default State: The default selected state in the Zoom to Address search pane. Expand the record to view Map Server specific map settings. In order for maps from a MapGuide server to be displayed in FacilitiesMap, the permissions for the maps in MGE must include the user that was used in the FacilitiesMap Server Settings. Application Tab URL: The url of the external application. Note that security is automatically passed through to the landing page using a request parameter called "Identity". The "Identity" variable is a string that can be decrypted using the FmStringParser.DecryptFromBase64String() function. Unfortunately, the encoding is hard coded using a string value, which is different than when security is passed through the data property hyperlinks, which uses the SiteEncryptionKey and SiteEncryptionIV values which is site specific. Note for ArcGIS Server 9.3: To display maps from ArcGIS Server 9.3 in FacilitiesMap, the map must be published as a “Service” in the ArcGIS Server that is referenced in the FacilitiesMap Server Settings. Here you can manage existing reports and searches. You can also assign role permissions to each. Roles may be assigned to or removed from any report by using the Manage Roles dialog. The default role assigned to any new report is 'Everyone' with Read access only. Here you can manage existing custom searches and create new ones. You can also assign role permissions to each. Roles may be assigned to or removed from any custom search by using the Manage Roles dialog: . The default role assigned to any new custom search is 'Everyone' with Read access only. Search URL: Specify the URL where the custom search page is located. Note that custom searches are intended to be client specific searches for functionality this is not already supported by FacilitiesMap's robust built-in feature search system. The results of the search must still be passed back to the FacilitiesMap application in order to receive standardized results in the infobar. For more information on support for custom searches, please contact Websoft Developers directly.